I’ve made various roasted potates before (see here & here), but I think these are my first of the wedge variety. I found this recipe on The Pioneer Woman. I heart her. Even if I’m not interested a particular recipe, her posts are always entertaining and her pictures are beautiful. These wedges paired perfectly with my Buffalo Ranch Chicken Wraps. You can switch up the seasonings however you want, I’ll show you what I used. Slice the potatoes into wedges, approximately 8 per potato. When I went into the cupboard to get the tin foil, a gallon ziplock bag fell out. It was fate. Throwing the potatoes, oil/butter & seasonings into the bag & shaking them up worked out beautifully. Put the wedges, a good coating of EVOO and the melted butter into the bag & shake to coat. Sprinkle in your seasonings and give them another good shake. Be generous with the seasonings! 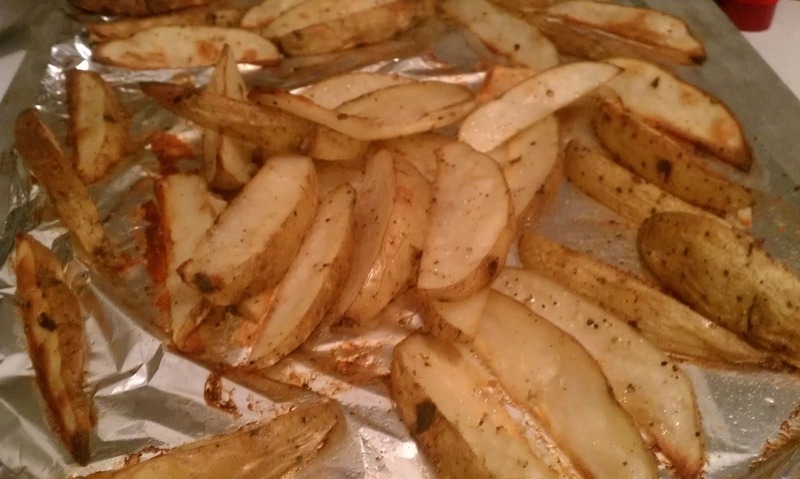 Dump the potatoes onto a foil covered pan, making sure they’re in a single layer & have room to breathe. Bake for about 20 minutes. Poke/flip them around then bake for another 15-20 minutes until golden and slightly crisp.